Gliding over the battered surface of Mercury for the second time this year, NASA’s MESSENGER spacecraft has revealed even more previously unseen real estate on the innermost planet, sending home hundreds of photos and measurements of its surface, atmosphere, and magnetic field. The probe flew by Mercury shortly after 4:40 a.m. EDT on October 6, 2008, completing a critical gravity assist to keep it on course to orbit Mercury in 2011 and unveiling 30 percent of Mercury’s surface never before seen by spacecraft. MESSENGER’s science instruments worked feverishly through the flyby – cameras snapped more than 1,200 pictures of the surface, while topography beneath the spacecraft was profiled with the laser altimeter. “We have completed an initial reconnaissance of the solar system’s innermost planet, enabling us to gain a global view of Mercury’s geological history and internal magnetic field geometry for the first time,” Solomon continues. The comparison of magnetosphere observations from MESSENGER’s first flyby in January with data from the probe’s second pass has provided key new insight into the nature of the planet’s internal magnetic field and revealed new features of Mercury’s magnetosphere. The Mercury Atmospheric and Surface Composition Spectrometer (MASCS) observed the extended tail, night side, and day side regions of Mercury’s thin atmosphere – known as an exosphere – searching for emission from sodium, calcium, magnesium, and hydrogen atoms. “The MASCS observations of magnesium are the first-ever detection of this species in Mercury’s exosphere,” explains MESSENGER participating scientist Ron Vervack of APL. Preliminary analysis of the sodium, calcium, and magnesium observations suggests that the spatial distributions of these three species are different and that the distribution of sodium during the second flyby is noticeably different from that observed during the first flyby. The probe’s Mercury Laser Altimeter (MLA) measured the planet’s topography, allowing scientists, for the first time, to correlate high-resolution topography measurements with high-resolution images. MESSENGER (MErcury Surface, Space ENvironment, GEochemistry, and Ranging) is a NASA-sponsored scientific investigation of the planet Mercury and the first space mission designed to orbit the planet closest to the Sun. 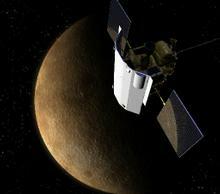 The MESSENGER spacecraft launched on August 3, 2004, and after flybys of Earth, Venus, and Mercury will start a yearlong study of its target planet in March 2011. Sean C. Solomon, of the Carnegie Institution of Washington, leads the mission as principal investigator. The Johns Hopkins University Applied Physics Laboratory built and operates the MESSENGER spacecraft and manages this Discovery-class mission for NASA . The Applied Physics Laboratory, a division of the Johns Hopkins University, meets critical national challenges through the innovative application of science and technology. For more information, visit www.jhuapl.edu.